In the past several years we have been fortunate to work with the following clients. These projects have challenged us to maintain the spirit and authenticity of the structures while adapting to the clients' needs and purpose. Our crew tends to the smallest details and delivers the highest quality historic restoration, preservation, and period-inspired new construction projects. For details on the projects, just click through the galleries and, for the captions, hover your cursor over the lower left corner of the image. The front view of the Epes home after restoration. The restored Epes house from the drive. Renovated kitchen features new island and cabinets built to suit a 1740s structure. 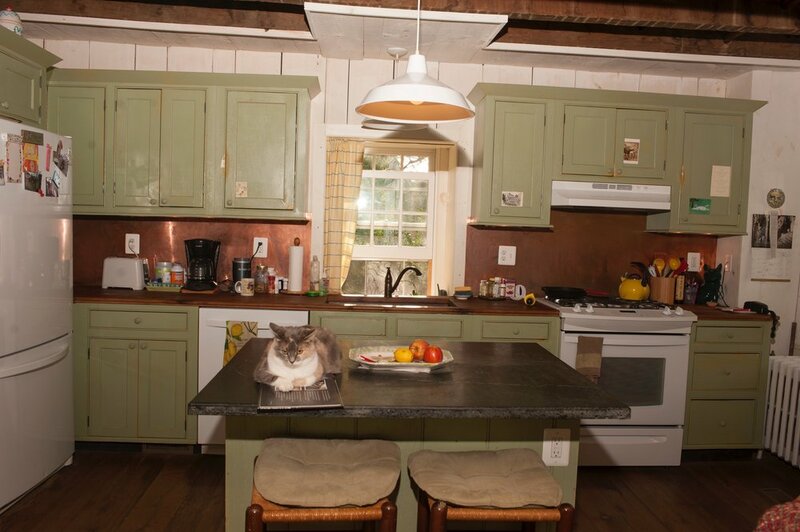 Another view of the renovated kitchen with Hannah, the cat, on her favorite perch. View of main room and fireplace. Since this photo was taken, Cochran's has installed a copper liner on the interior back wall of the fireplace. Master bedroom features restored beams and radiant-heat brick floor. Bedroom fireplace features a bricked-in beehive oven. Upstairs bedroom with adjacent bath..
Gail and Perry Epes with their dog, Jacob, and Allen Cochran, who restored the masonry and renovated the interior of the original spring house into a small and delightfully livable space. The way to the guest house's sleeping loft is by ship's ladder. Allen Cochran reviews the property plat with Perry Epes as they make plans for a fence. At the corner of Foundry and Taylor roads stands a small stone house built in the mid-18th century by Jacob and Hannah Janney. These two Quakers left Bucks County, Pennsylvania, in 1745 to begin farming on their deeded property and founded the Goose Creek Meeting in the village that is now Lincoln. A progressive house—meaning the building in its entirety was constructed at different times—it has two sections, each one and a half stories. The original section of the house has two front doors on its west elevation, and its internal central chimney exits the eave rather than the gable of the building. For more than 250 years the home remained in the hands of local families—the Janneys and the Taylors—until the late 1990s when it was purchased by Gail and Perry Epes. Both served at the Episcopal High School in Alexandria, Perry as head of the English department and Gail as a priest. When most couples are considering retirement, downsizing and moving to a convenient in-town location, Gail and Perry did the opposite. 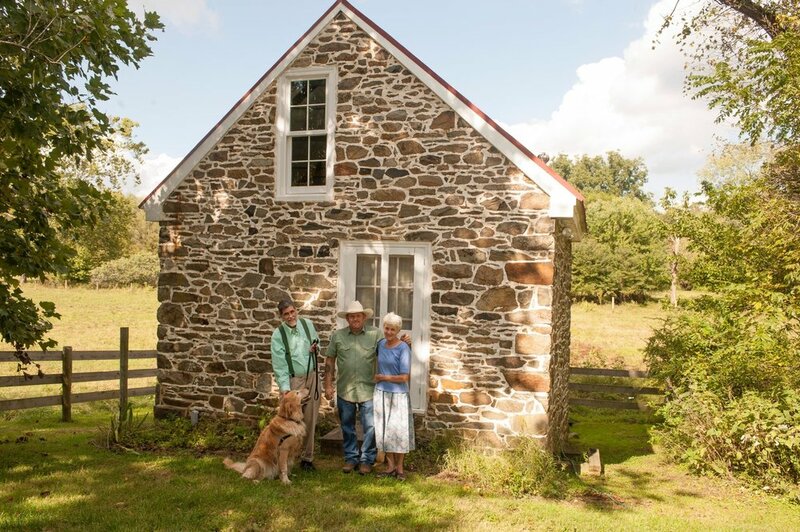 They left their school-provided accommodations and moved to rural Loudoun County and rehabilitated the stone house in 2011 as their retirement home. Knowing the Epes were not working with an unrestricted budget, Cochran's approached the project with three principles in mind: 1) the project would have to be sympathetic, 2) practical, and 3) economical. The 1745 home of Jacob and Hannah Janney before Cochran's restored the house for Gail and Perry Epes. The house had good bones. All the walls were straight and sound, and the roof had been replaced by the Epes several years earlier. Among the biggest obstacles were the windows. At some point, the originals were removed and replaced with metal barn sash windows, very cold and very inappropriate. The solution: Cochran's milled heavy timber jambs from salvaged logs in the addition, shaped profiles that match the period, and set new Marvin windows in the replaced jambs. Cochran's expanded the 1950s shed addition slightly to accommodate a master bath while replacing the floor in the addition and bath with brick laid over radiant heat. Working within the existing footprint, Cochran's designed cabinets, an island, and other fixtures in the 18th century spirit, all with reclaimed materials. The front porch had been closed in and a deck added. Cochran's removed the deck and took the porch back to its original look and design. The result of this work is a comfortable home that Hannah and Jacob Janney would likely recognize. In 2014 the Loudoun County Joint Architectural Review Committee recognized this project for excellence in the category of Restoration and Rehabilitation. Period Inspired: The Barn at "Little Washington"
The two-story side of the bank barn in Washington, Virginia, shows the brick surrounds, stone foundation, and corner columns. Upper level of the barn at Washington, Virginia. Evenly set courses of stone. Brick arches suggest past repairs on a historic barn. Allen Cochran with builder Tom Greer outside the barn's upper level. Allen Cochran, masonry manager Will Brown next to Cochran, and Brown's crew on the Little Washington job. When the owner of this property near Washington, Virginia—best known as "Little Washington"—decided to double the size of his 19th century Italianate house, he also decided to build a large stone barn to include an office and storage space. The architects, Madison Spencer Architecture in Charlottesville, Virginia, had heard of Cochran's Stone Masonry and our reputation for authenticity. Spencer contacted us in 2015 in the development stages of the project and expressed his goals for the building. It had to appear to be a period structure; he wanted it to look as if it had been repaired, and it must be constructed with local stone. Stones that were blasted from a pond being dug on the property were ultimately used for the barn walls. We developed a method of antiquing the pointing to appear weathered, and we used handmade Old Carolina bricks for the arches and infills. Working closely with Tom Greer of Greer & Associates builders in Charlottesville, we exceeded the architect's and owner's expectations. And as so often happens, we formed new working partnerships and made friends. Client Alan Croft stands under the arch devised by Allen Cochran to bear the weight of the barn ramp, leaving the lower-level stone still visible. View of the stone barn from the Crofts' home. Period inspired barn features new windows set into custom frames of salvaged materials. The stone arch supports the barn ramp. Barn doors incorporate smaller entry door. Close-up of window featuring new Marvin window set into custom frame of old wood. Series of images: Exterior barn window is surrounded by traditional masonry. The interior stone is common, unpointed rubble, true to period construction. Corner support at lower level. A garland of dried flowers from the Crofts' daughter's wedding still decks the barn. Our partnership with Alan Croft began when we constructed a patio around a small pool at the 18th century Greek Revival home that he and his wife, Ilona, had dismantled in Connecticut and reconstructed in Northern Virginia. What followed were two major projects—the building of an all-new stone barn and the restoration of a log home as an addition to the home. It is likely that the Crofts' barn is the first solid stone barn constructed in Virginia using lime mortar since the late 19th century. Croft found a framed board and batten barn at the intersection of Routes 7 and 267, better known as the Greenway. He purchased the barn, saving it from inevitable demolition. Then he called Cochran's, which labeled, documented, and disassembled the barn and stored it at the Crofts' property. When the Crofts contacted Cochran's to begin the reconstruction, they made a small change. Instead of just a stone foundation, they wanted stone walls, too. We made the required foundation changes and repaired the disassembled timber frame where it had some rot, and set the floor system and frame. Meanwhile, Croft had 200 tons of stone delivered that he purchased from a local farm. Two-foot-thick stone walls were constructed with lime mortar, the exterior pointed with a traditional "V" profile, window jambs angled, and small, tall vent holes built through the gable walls. Alan Croft presented us with one major challenge: to find a way to not cover up the stonework below the bank barn ramp with dirt fill. Our solution: a supporting arch. The Crofts moved the Greek Revival house from New England and restored it here. Cochran's reconstructed and custom-designed the log addition. Closer view of log reconstruction. Rear of house and log addition. Three-level front facade of log building. Handsome main fireplace is surrounded by cabinetry found by the Crofts. Lower-level kitchen with beehive oven. Three door styles in the addition: interior kitchen level door, exterior of the same door, and cabinet door. Corner stonework supports the structures logs, all notched at the corners. 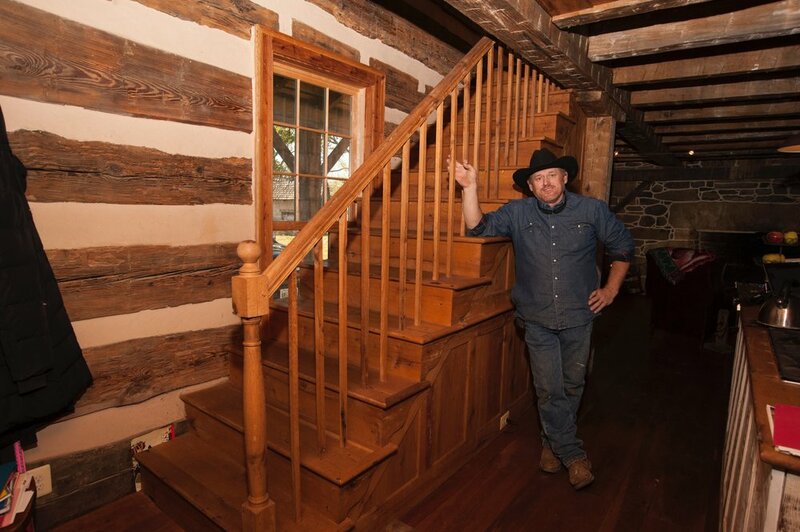 Some time after the Crofts moved into their restored Greek Revival home, Alan Croft fell in love with an 1870 West Virginia log home. Constructed of hewn pine and oak logs, some with 20-inch faces, the house also had original floors and paneling. With those logs, combined with the paneling and hardware that Croft had been collecting for years, this promised to be a special project. Cochran's excavated and constructed solid stone walls to create a full basement for the log house to rest on. Downstairs is a typical 18th century cooking fireplace with a beehive oven. The first floor has a large fireplace that was made to fit one of the Crofts' salvaged wall panels, which was eventually faux-grained to mimic 18th century style. An upstairs bedroom has a small fireplace in it as well. A wood roof, relaid original floors, salvaged doors, the owners' hardware, and Alan Croft's attention to detail make this house addition among the nicest period log buildings Cochran's has reconstructed. Nancy and Allen Cochran on the front porch of their historic home. The main stone house from the drive. In the log house addition, new windows are set into reclaimed wood frames. The massive stone fireplace is set into the thick "ender." wall. Allen Cochran stands next to the original newel post of the log building. 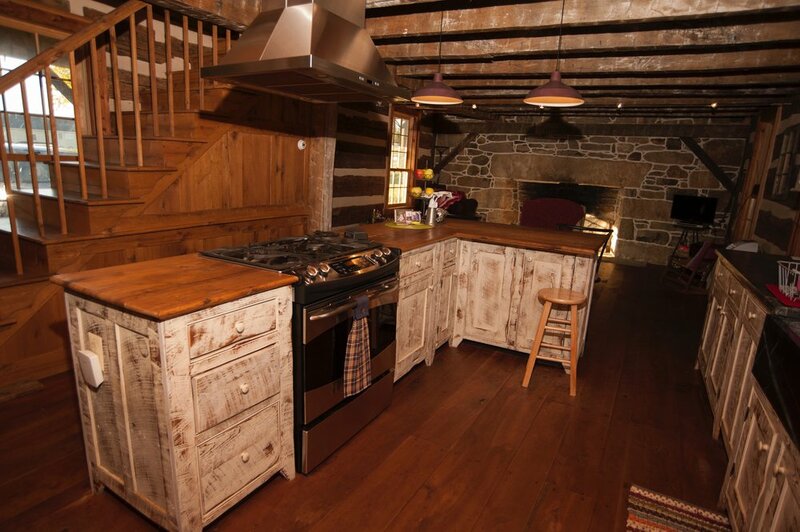 The log house kitchen features cabinetry designed and built by Allen Cochran. A view of the house showing its Italianate porch and trim. The Cochran's farm, where a flock of sheep often grazes the front fields. 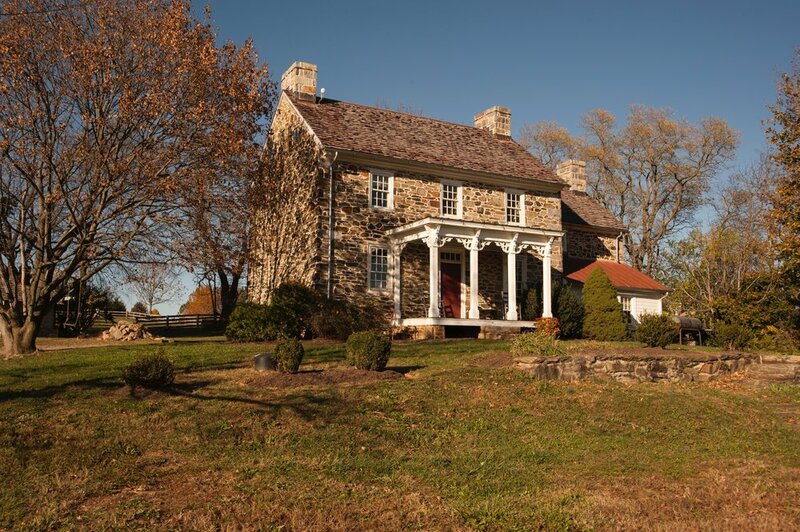 Stone Eden Farm near Lincoln, Virginia, was built in 1765 starting as a "patent house." 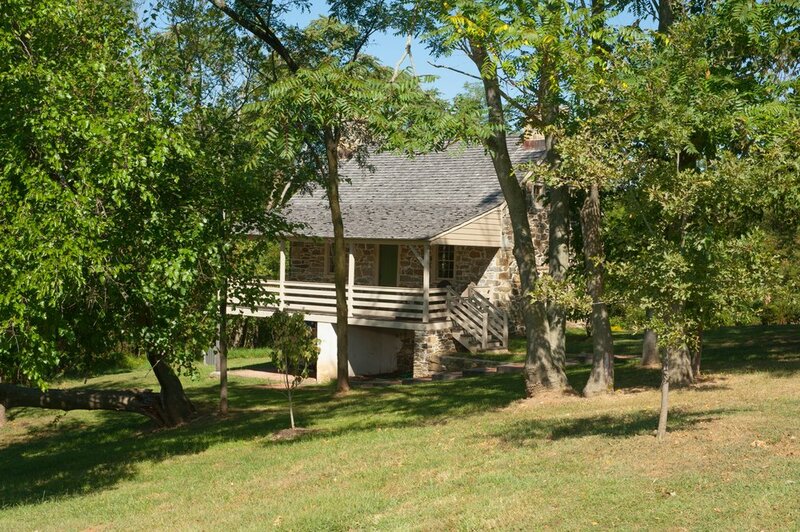 The land agents of Lord Fairfax required grantees to build such a dwelling within certain measurements and to occupy the land and building for a period of time to secure ownership of the property. Then, afterwards, as families grew,the larger additions came. There are many representations of the progressive building method. The land was originally deeded to the Hatcher family in whose hands it remained until the 1930s when the Brown family purchased it and named the farm Stone Eden. Then, in 1999, the Cochrans bought what was left of the farm after development, thus keeping its ownership in the Goose Creek Meeting community for more than 250 years. 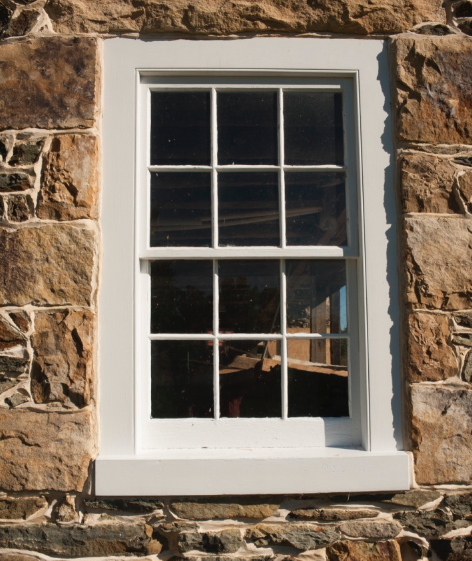 We have restored the stone house with great attention to detail, keeping as much of the original fabric as possible and using only vernacular material when needed. When we elected to build an addition to the house, we chose to use log construction. Mrs. Brown remembers the remnants of a log building attached to the house when the Browns moved in. We found a center hall log structure in West Virginia that had wonderful paneling, flooring, and stair railing, all original to the building from the 1870s. Unfortunately, the north gable of the structure suffered from a great deal of rot. We resolved that issue by gathering stones from our property and constructed a "stone ender"—a 32-inch thick, solid stone gable wall with a 7-foot cooking fireplace. Reusing the salvaged material and timber from a fallen tree in my grandmother's yard, we completed the new kitchen and upstairs master bedroom. The finished addition appears as an original part of the progressive building's history. The Parses's stone home today with masonry restored by Allen Cochran and the interior by owner Matt Parse. Matt Parse, owner of the historic Amos Goodin house. A "before" photograph of the Parse home hangs in Allen Cochran's office. The house's winder stairs had been exposed to the elements for decades. Matt Parse restored them. Hand hewn beams support porch. New masonry matches original farmhouse stonework. 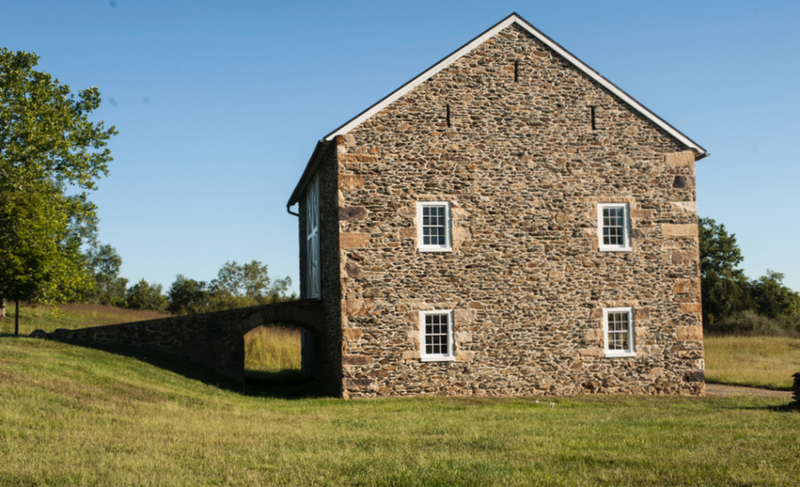 Long after the Wright Farm in Loudoun County, Virginia, was sold to developers, the stone farmhouse that Amos Goodin built in the early 19th century remained inhabited—by vultures and groundhogs. Finally, the County declared it a hazard and told owner Matt Parse to bulldoze it. But Matt, who had already converted the stone barn on the property into his home, wasn't about to let this gem bite the dust. While he is neither architect nor mason, he has a craftsman’s eye for detail, perhaps inherited from his parents who restored old buildings as a hobby. But Matt knew he had his hands full. A seven-inch separation crack on the gable wall, no windows or doors, failed front porch, and a leaking roof would have turned most people away. Matt phoned Cochran's and together we developed a plan to restore the stone building for Matt and Brenda's guest house. We had to stabilize the interior structure and completely remove the gable stone wall and interior chimney. We installed a correct footing and reconstructed the wall, fitting it back into the original components as it went up, all constructed as the original with our lime-clay mortars. We stabilized the front porch walls and timber-framed the floor system with flattened tops and bottoms of locally harvested oak trees. Then we installed a locust floor and mortised and tenoned the railings into the oak post. We designed and installed a built-up roof system, allowing the roof rafters and sheathing to be visible on the inside and installed our sawn white oak shingles for a roof. And we made all-new, single-pane window sashes and a front and back door. The windows were placed in the original jambs, and we made matching jambs for the doors. Some spot pointing around the remaining sections of the house and Cochran's completed our scope of work. Matt jumped in and had the interior walls plastered and the floors refinished, and the house looks exactly as it did 150 years ago. Michael Vick and Allen Cochran in the two-story center section of the barn. The three-level side of the brick bank barn. The one-story entrance to the barn's upper level. "Vents" were engineered by Allen Cochran to resemble the real thing. To give the illusion of openings, he set black bricks on end and recessed them. Railings on the upper level create a safewalkway between the sleeping area on one side and an entertainment center on the other. To the left of the main barn entrance is the beamed sitting area with a fireplace. Stairway from the sitting area up to the entertainment space. When Michael and Robin Vick purchased their early 19th century property, it came with a ruin of a brick barn in addition to its historic house. Being brick in Loudoun County is unusual enough but surviving the Great Burning Raid of 1864 makes this barn epically unusual. Realizing the uniqueness and potential of the building, they elected to convert the building into a living space and called on Cochran's. In a close creative partnership with the Vicks, we formulated a reuse plan that accentuated the barn's unique details, maintaining authenticity while meeting the Vicks' wishes. After addressing the structural issues, we began the restoration along with the period inspired interior. We reconstructed the missing right loft, using the same size timbers as the original ones and framed a connecting catwalk to the existing left loft. We removed the original 2-inch-thick floor boards and had them re-milled and replaced on the first floor. We sealed the barn's vents but retained their original appearance by putting black bricks in the openings and recessing them just enough to create the illusion of an opening that casts shadows. And the Vicks found a salvaged paneled door that we made fit the opening into the bathroom. Mike Shockey oversaw the project, making and installing all the paneling. We also finished the floors with linseed oil and beeswax. Thrilled with the job, the Vicks see themselves using the barn as much as they do their historic home. Mike Bailey, the developer's point man on the barn reconstruction, with Allen Cochran. The barn with side doors open. The peak enhances the barn's design. Timber frame comes from an original bank barn on the property. 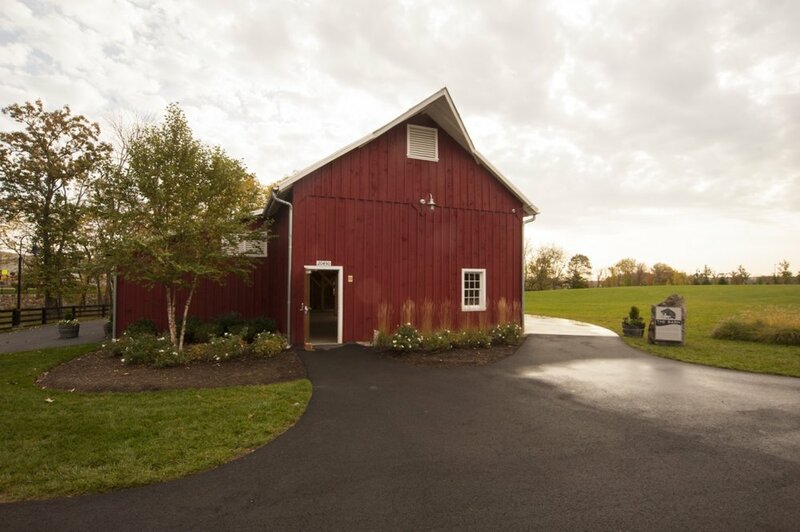 When the owner of a mixed-use development in eastern Loudoun County found a late 19th century barn on the back end of his large tract of land, he thought it would make a great backdrop for a community center. After contracting Cochran’s, we labeled, documented, and cataloged the timber-framed barn and stored it for reconstruction. Working closely with the owners, architect, and engineer, we developed a plan to reconstruct the barn matching the original elevations and details while meeting the local codes for public occupancy. With the owner’s representative, Mike Bailey (with Allen Cochran, above), Cochran’s reconstructed the barn from raw land, installing the footings, foundation, and slab. The timber frame was pre-cut in our facility and erected on the prepared foundation. Large men’s and women’s restrooms were constructed on the rear of the building using a traditional “cat slide” roof connection. Cochran’s also completed the siding and roofing, oversaw the electrical and plumbing, and finished the interior and exterior trim. The barn is currently being used as an amphitheater, farmers’ market, and community venue. This project is a brilliant example of how traditional architecture and building techniques can exist compatibly with a development's modern construction. Lime-clay mortar for chinking in the historic style. Wooden shakes on the roof are true to the period. Cochran's Stone Masonry preserved the Crofts' corn crib using lime-clay mortar for chinking and wooden shakes for the roof. Cochran's restored the brick wall around President James and Dolley Madison's graves at their Montpelier estate. Cochran's Stone Masonry restored the stairs of the Tomb of the Unknown Soldier at Arlington Cemetery. Cochran's restored brick walls at Stratford Hall, home of the Lees of Virginia and birthplace of Robert E. Lee.